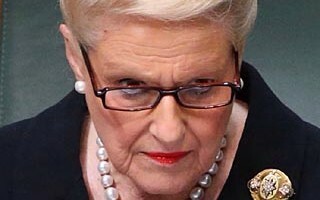 “Should Bronwyn Bishop resign?” Yes. Many will agree with you Pat. Yes the crone should resign. This latest disclosure, including the cost to the taxpayers of her trip to Europe, whilst aeeking a job over there, if you don’t mind , two staff ?? ?, paying their wages, food and accommodztion, as well as airfares for all concerned – What The Hell???? And we were told by this pack of liars that Labor left the vountry broke ??? Off with her head !! Oh well her job at the very least! Yes, that good old fiscal crisis is suddenly not being talked about much. NO EXCUSE. Peter Slipper was absolutely, mercilessly hounded and put through hell by the Liberal ghouls, he was crucified, lost his job and this wrinkled old prune says she thought it was ok.
She’s a thief and needs to be prosecuted as Slipper was and then thrown out of politics for her dishonesty. It is risky to accuse someone of theft under these circumstances, especially as the Fed Police don’t seem interested. But the famous old Aussie term “rorting” would appear to apply. What the practical difference is only a politician could explain. GORN. No way she can survive if she has signed the form stating it was “official duties”. It was a Liberal Party fundraising event. Put the Slipper in Shorten! And then let’s have a closer look at the claims she made for overseas travel last year. “The age of entitlement is over”. A thousand dollars a day on limousines? You can fly halfway round the world for that. Disgusting. She should definitely resign& if she doesn’t of her own free will, Abbott should request her resignation & the AFP should step in & take her to task. Peter Slipper’s mistake was small change compared to this & who knows what else she has wrongly claimed for. Attending a Liberal party fund raiser is in no way part of her official duties & she should know that. In any case, the charter of a helicopter at a cost of over $5000 to take her on a 100 km trip is preposterous & shows that she has no regard for the people of Australia whose money she appears to consider her own to spend at will. I agree: sadly it appears Tony Abbott is prepared to wear any level of approbrium to protect his hand-picked and very partisan Speaker. F*** That. A Guided Meditation.